How can a professional speaker add value to your business? entertains your clients and contributes cost effectively to HR development. Why choose a speaker to inspire and educate others? Everyone is short of time. Organisations no longer wish to invest in traditional training where people are away from the workplace for days at a time and conference attendance has become a luxury. With fewer resources and increasing demands to achieve more with less, managers are seeking creative ways to ensure people are agile and productive. New methods of learning are sought in a context which enables individuals to apply these newly learnt skills back into their jobs. Professional speakers can provide the solution for organisations to bridge the skills gap but how can you ensure you get the right person for the job? 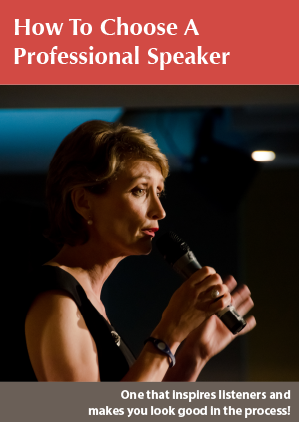 Clare Mann is a renowned speaker who has spoken to audiences all over the world. She combines humour, intrigue and intertainment to enhance learning and maximise transfer of learning back into the workplace. Lunch and learn style teaching. Enter your details and we’ll send you the report.